The catering and events market is expanding rapidly, making superior service an absolute necessity for distinction and successful branding in the event planning industry. Remarkable Banquet Service provides catering and event professionals with straightforward advice on all aspects of exemplary banquet service. 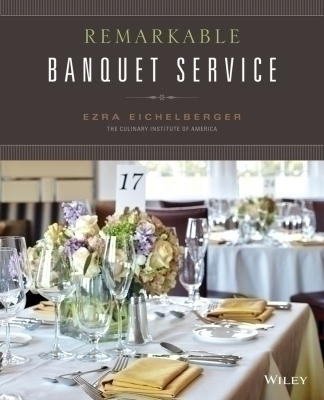 This resource covers everything from food and beverage service skills—such as setting up a buffet, butler service, tray service, pouring wine, and clearing tables—to managing staff and coordinating with vendors such as florists, wedding planners, and musicians. Throughout, key service points are illustrated, such as buffet setup, proper plate handling, and synchronized service techniques, as well as guidelines for handling specific events, including business luncheons, fund-raising events, bar and bat mitzvahs, weddings, and wine-tasting dinners. Step-by-step techniques are accompanied by 100 photos, 40 illustrations, and 10 reproductions of menus, taking all the guesswork out of organizing and managing remarkable—and profitable—banquets and events.